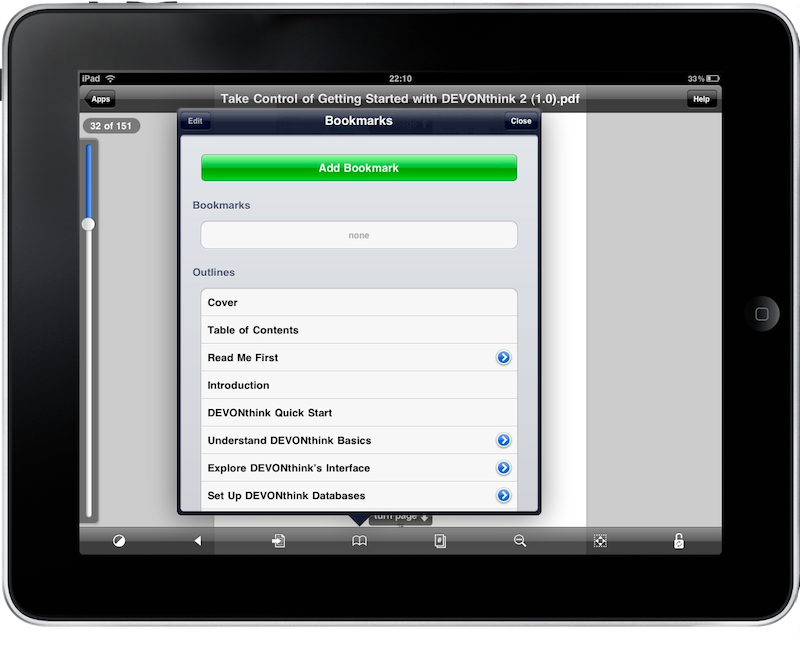 There's this iPad application which is going pretty good in the App Store, GoodReader. I heard a lot of people talking about it and, after a while, I was curious. So I decided to buy it and see if it can effectively hold up to the expectations I have. Here a my impressions so far. First and foremost, Good Reader reads files. If you're looking for some sort of multi-editor for multiple file types, then Good Reader isn't the app for you. The greatest selling point of this app, in fact, is that you can connect to many kinds of online servers or your local computer to import files (images, documents) and read them / organize them into the app's interface. Ultimately, Good Reader is an application that can pull most every kind of file from the Internet and store it into its database. You can read, but you can't create. If this sounds cool to you, keep on reading. For what it does, Good Reader is a great software. The main window of the app consists of a split view (both in portrait and landscape mode, the app doesn't use popovers in this way) that allows you to browse your files on the left and perform various actions on the right pane. The left panel features a design very similar to Mac OS X' one, there are folders allocated in a vertical list and the actual files are presented with the icon of their file type. If you're used to the list view of your Mac, then you'll immediately understand how GoodReader works here. But the left part isn't as much interesting as the right one when it comes to "do stuff". Indeed, GoodReader allows you to download files by simply specifying a URL, configure multiple servers and act on files much like you can on the desktop. There are 5 different tabs in this panel, each of them is very useful depending on what you want to do with a file. The first one is the Preview tab, which gives you a graphical representation of the file selected on the left. It's very similar to what happens on Mac OS, as it can preview images, documents and videos: the video will start playing inside a thumbnail that you can even control with play / pause and a scrobber. Too bad this is sometimes buggy and slow, but I guess perfection is just an update away. The second tab is the Find Files one, which acts similar to Spotlight and can retrieve every file based on your search criteria. While I'd like to leave the Manage Files tab for later, Web Downloads is the fourth one, and it's the one that lets you browse the internet or enter direct URLs to files. The URL option is nice, the possibility to browse websites using the integrated is great, given that you can even save entire web pages for offline reading. They'll be saved as .HTML copies of the original page. The download process is fast and stable, though the app might freeze for a few seconds while initiating the download. This is quite annoying but, again, it should be fixed soon. The last tab, Servers, is the most important feature of GoodReader. The application supports a lot of servers and online services: Dropbox, Box.net, FilesAnywhere, FTP, WebDAV, MobileMe and mail servers. Yes, mail servers: you can configure popular mail services like Gmail or your own IMAP or POP server to browse mail messages that contain attachments and save them into the app. As you can guess, the Dropbox option is neat as well, considering how popular this service among Windows and Mac users. The possibility to browse your entire Dropbox and download files to view on the iPad has turned out to be very useful: I've been able to view PDFs and screen recordings directly on the iPad, without the need to fire up my Macbook and leave the couch. Server files will be displayed inside a popover window, but I found weird that you can't close the popover by tapping on another zone of the screen, you have to tap on a close button instead. This is an important usability trick the devs should fix as soon as possible. For all the other things, the servers feature is great: not only I can access and download my Dropbox and MobileMe files, but I've also set up my IMAP server and a Gmail account to retrieve all the attachments I receive every day. Last about the right panel, there are some icons in the bottom toolbar that you can use to import photos from your iPad library, open the settings and start the integrated web server. The web server allows you to use your desktop browser to access the Good Reader directory and upload files from your computer, while the settings have a lot of options for every file type. Good job. Managing and reading files with GoodReader is well realized experience and feels good overall. You can copy, paste, star using the Manage Files tab on the right, which has so far allowed me to easily move files, mark them as unread and create duplicates around. 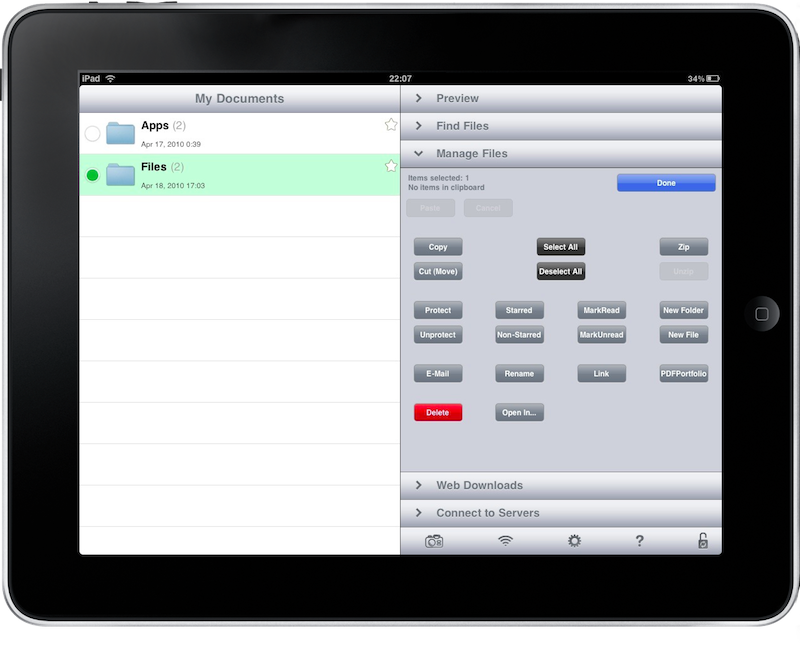 It's full featured file managing, and feels right on the iPad, with its large screen. I appreciated the possibility to zip files, choose to open them with other applications and create a GoodReader link to paste on other apps that support this feature. 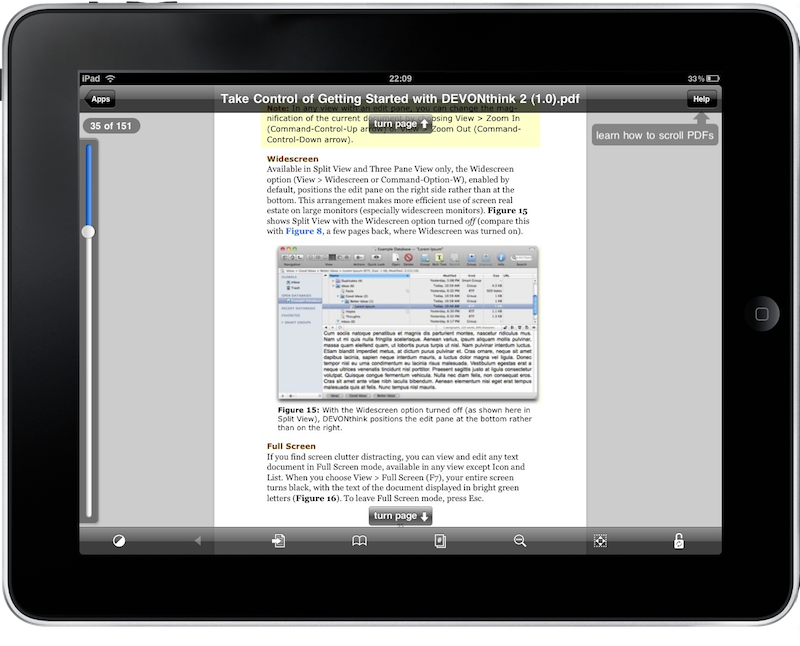 Reading PDFs with GoodReader is a good experience as well. The app offers a lot of options to bookmark pages, search for specific words and change the brightness, but I don't like the current way the app changes pages. I heard the animation will be completely rewritten for the next update, which is great. I found myself reading a lot of documents with Good Reader, bookmarking pages for later and search for words. It's well realized and it should get even better anytime now. The only thing I don't like about this app is the interface, which is not exactly elegant and great looking. I hope the developers will work on it in the future, because the app is very functional and needs a better design. As of now, GoodReader is one of the best applications to manage files and read large documents you can find in the App Store. 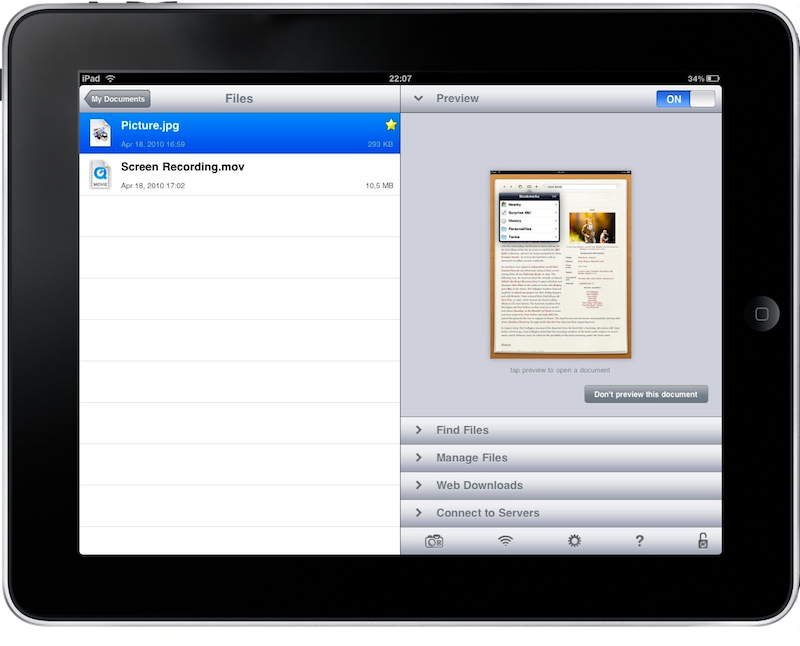 With Dropbox access, mail integration, encryption capabilities and lots more, this app is a must have for every iPad owner. And at $0.99 [iTunes Link], I guess there's no doubt about it. P.S. I hate the icon. Please update it.